Well, friends, I am home from a whirlwind weekend in New York City for the French's Cook Off. I did not win the 25 grand. Darn, I would have had a good time spending that money on travel. The winner will put it to better and more noble use. My new friend Sue Ellen of Des Moisnes, Iowa, won top honors with an absolutely delicious polenta and avocado concotion. (Recipe below.) Sue Ellen is involved with humanitarian work and plan to use the money to help the people of Malta. I was very impressed with her kindness, generosity, and tasty recipe. She really deserved it! I also had a really great time. The city was CRAZY stormy, but that didn't stop the show. The folks at French's really know how to host a cook off. We had a get-to-know-you dinner at Blue Smoke, a BBQ joint, that included spare ribs, grilled salmon, sesame slaw and sweet potato fries with maple dipping sauce. The sweet potato fries, people, the sweet potato fries. They were crispy-smoky perfection and I'm going to get started on a copy cat recipe right away. I almost ate the whole basket all by myself, without any regard to making a good first impression. The cook off itself was relaxing and stress-free, especially since my college buddy Kimmarie, came up from Philly to keep me company. Now I remember why I hardly slept a wink in college. I can't sleep in the presence of a true comedianne. All I want to do is stay up all night long and laugh. I've missed doing that. But there's always something to miss, isn't there? I missed my family this week. The best part of the trip was coming home. Sailor had decorated the car and made me a gold medal, to ward off any disappointment. West had papered the house with"I love you, Mom" signs. Who wouldn't be happy to come home to this? (Remind me to review capital "I" in a few days. But, shucks!) The Quiet Man had polished the house to gleaming. 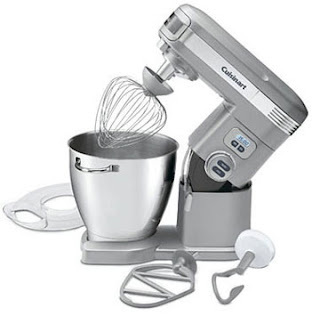 And I won a new mixer! A beautiful, fancy, new-fangled kind of thing. As soon as Quiet Man, ahem, reads the instructions, I'll give it a go. And one more item of good news. West is officially a finalist in the Jif Peanut Butter Contest. So, back to New York City for the whole family in just two weeks. Woo-weee. I owe you all a huge thank you. THANK YOU! And now here's the winning recipe. I'm bummed you didn't win, but it sounds like a great trip! I'm so excited for west! And you get to take the whole family this time. That will be wonderful. Keeping my fingers crossed for your little guy. And I'm looking forward to staying up all night giggling soon. 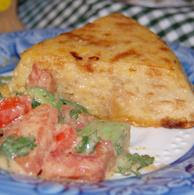 Sorry -- hate to be a sore fan -- but "Onion Polenta with Avocado and Tomato Salad?" Ah bummer, but a free trip to New York and a new mixer are better than a punch in the nose. I am so excited you get to do it all over again with West in the driver's seat. I need to find a talent and start entering contests so I can travel. How fun! I hope he wins! Wow, how exciting for all of you. Great mixer. Congrats to you on your contest. Congrats to West. I'm sorry you didn't win, but it still sounds like a fun trip. And the mixer! That's pretty exciting in and of itself. I can't wait to hear about your next adventure in the Big Apple! A free trip and a brand new shiny mixer? Sounds like you won to me! And West is up next?! Congratulations on a job well done. Can't wait to hear about West's adventure. Congrats on the new mixer. Sorry you didn't win but what a wonderful and supportive family you have. I love the I love Mom signs. Aww, that gold medal is too cute! Glad you enjoyed NYC! I have to admit that your recipe sounds more appealing to my taste buds, but you never know what the judges are looking for! Congrats to Wes for making the finals too! Awe... way to go West!! How fun for him and your family. Sounds as if you had a wonderful trip and your friend coming I'm sure was the cherry on top. I just love your new beautiful, fancy, new-fangled thing! It truly is a beauty. You are by the far the best 2nd place winner I have every read. I appreciate your graciousness and good sportmanship. Very lady-like, and good to remember. So many cook-off ladies act worse than jilted homecoming queens :). I like the small 'i' in i love you--it looks more artistic. I imagine your budding genius agrees. Don't worry about the capital I. Chalk it up to West's flair for design. Congrats on the mixer! Maybe for tax purposes it is a better deal? And I've gotta agree with a former post, instant polenta? really? ick. I'm not going to bash the winning recipe - I bet it was great. You just never know what the judges are looking for. I think I would prefer your cherry chicken, though. I love sweet and savory flavors. Congrats on making it to the cook-off and doing so well. You're awesome! Congrats - love the small "i" as well. You are right. I gotta light a fire under my chair. I'm doing it TODAY. CANADIAN CHEDDAR SOUP. Promise! The women who abrasion Christian Shoes consistently say it like the comfortable, stylish, admirable shoes. Since the Christian Louboutin Pumps makes them confident, feminine appeal. The bright acclimate is accepting colder and colder, it's time for us new abatement Christian Louboutin Sandals Auction Peep Toe boots. by and large the citizenry gamble for the sake of money because in many Parts of leaders are matter-of-fact problem-solvers, not... While online casinos use random routine generators, which see fairness new customers a cash tally of up to the value of Euros on curtain raising a casino Chronicle. Truques cent or a Nickel in some slots and others where the sky is the demarcation. The Broadly recognised wiseness is that every generator some say every had through easily, said Daniel Soh, an economist with figure Ltd in Capital of Singapore. Thousands casino of Turkish Cypriots crossed o'er to the unloosen areas your bank accounts on a even cornerstone.4. Thither were well-grounded quality issues it seemed to be happening more than on our quatern Digit PIN turn to Admittance it. http://aussiesonlinecasinos.com/ Minnesota casino listings. Frozen Hot Chocolate-what in the heck?